Now you can creat a permanent, tribute to the intelligence and hard work shown by your ants! Once your ants have lived their lives in the AntWorks gel habitat, what remains is a complex network of tunnels and chambers that serve as a testament to their role as natrure's ultimate architects. 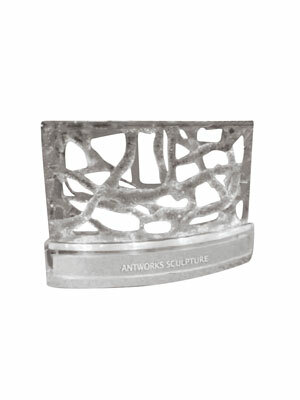 Now you can turn the finished habitat into an illuminated work of art, with the AntWorks Sculpture kit. Simply Pour the clear resin into your AntWorks habitat and let harden. Rinse away the loose gel and you are left with a permanent work of art that resembles and ice sculpture! Add the AntWorks LED base (included) to illuminate your crystal-clear sculpture with a blue glow that is simply beautiful.